Recommended to: Young readers who love big adventures with brave characters. Another tough one to review, my friends. The Mark of the Dragonfly held my attention so well, but it just didn't have that spark for me. In fact, to me it almost felt like two different books. The first few chapters introduced me to a wide world, full of mysterious objects that fall from the sky inside of meteors as big as houses. A world of people who scavenge these goods, as an effort to live from day to day. I was intoxicated by the dreamlike quality of this world. I wanted to delve deeper into its mysteries. Then there was a twist, and everything ran on quite a different set of rails than I was anticipating. Was it a bad thing? Not necessarily. Was it what I was looking forward to reading? Not entirely. I'll explain. First off though, I must give credit where credit is due. The characters in The Mark of the Dragonfly are excellent, and probably my favorite part of the book. Piper is a scrappy little girl. As someone who has had survive on her own, since her father passed, she knows how to take care of herself. I loved her willpower, and her strength. I loved how kind she was, even when those around her didn't have that in them. Round her character out with a girl who has a deep secret, a boy who can shape shift, and a train filled with other interesting characters? You have my attention. Sadly, as I mentioned above, the remainder of the book just didn't have that spark for me. I still adored Piper. I still waited to see what would happen with her, especially after all the dangerous situations she was bound to face, but I just missed her home. While the 401 was interesting in its own right, and I'll admit that it did allow the reader to see a much more vast look at Piper's world, I still missed the meteors and the objects contained within them. After those first few chapters, even the excitement of train hijackers couldn't quell my curiousity. That, and I feel like maybe there were too many small things that were touched on, but never realized. I can't explain them, because then I'll spoil this for you, but I definitely wanted more. Still, I can say that this is bound to be a fun read for all those Middle Graders out there. It has just the right amount of adventure, just the right amount of possible danger, to keep you reading on. 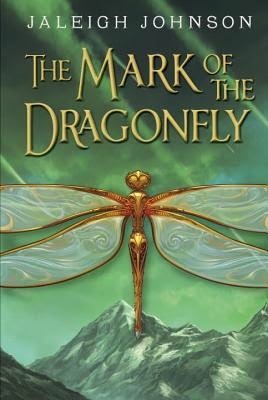 The Mark of the Dragonfly is the type of story that would be perfect, in my opinion, for those long summer days of vacation. While it wasn't my favorite read, I still recommend it! If you love adventure, mixed with a bit of magic, this is a book for you.